Home Industry News Why September is important for the Indian Electronics Industry and Market? 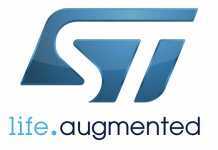 Why September is important for the Indian Electronics Industry and Market? 'electronica India and productronica India' will take place from September 14 – 16, 2017 at Pragati Maidan, New Delhi. September is an important month, marked on every calendar in the Indian electronics industry forum, as it prepares to welcome the 18th annual edition of “electronica India and productronica India 2017” who is already here knocking on the door. The twin mega event along with ‘Laser World of Photonics India, 2017,’ is known for being the rendezvous of international and local market leaders from the electronics components industry, display products and production technology, thus creating a cutting edge communication and business environment. The event venue shuffles between two Indian economics hubs New Delhi, at Pragati Maidan and Bangalore at BIEC alternatively, and this year the exposition is going big with the event area spreading over 20,000 sqm exhibition area and 8 halls, at Pragati Maidan, New Delhi. According to several reports and surveys, Indian electronics market is poised to be one of the largest in the world and is anticipated to reach US$ 400 billion in 2022 from US$ 69.6 billion in 2012. The market is projected to grow at a compound annual growth rate (CAGR) of 24.4 per cent during 2012-2020. 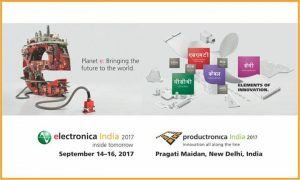 ‘electronica India and productronica India 2017’ is also organizing a host of events in parallel, that shall be exploring several key sectors in the industry. 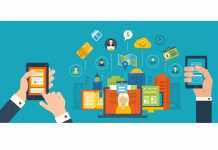 An international Internet of Things event will be held concurrently with the trade fair. This will be the third edition of the conference aimed to bring together technology experts academics and business professionals to focus on new developments, trends in the artificial intelligence and its role in the electronics industry. ‘India PCB Tech’ is a joint initiative by ELCINA and Messe Muenchen India, to bring the entire PCB industry eco-system and related supply chain together. The second edition of the India PCB Tech conference will showcase the latest PCB technologies from the best manufacturers and their suppliers from across the globe to cater the growing demand of PCBs in various industry segments. As a forum to bring together high-level strategic experts, top decision makers and CEOs at one place, the second edition of the CEO forum will be deliberating on opportunities and challenges faced by the ESDM sector. Launched in 2016, the forum gave an excellent chance for thought leaders to interact and exchange information in an open forum. The second edition of Invest India will take place in 2017. Invest India is a platform for international and domestic manufacturing companies to explore the investment opportunities in the Indian Electronics System Design and Manufacturing (ESDM) sector in the different India states. The Buyer Seller forum is a unique platform to connect major buyers with sellers of electronics components, products and equipment from various segments including automotive electronics, consumer electronics, LED and lighting and industrial electronics to name a few. In 2016, over 1,000 meetings were successfully conducted. IPC India will organize a one-day conference on PCB manufacturing covering design, quality, reliability, assembling and testing aspects in detail. IPC India will also initiate a hand soldering competition to identify and encourage the best talent and intricate skills in hand soldering of complex electronics equipment. “To support the ‘Make in India’ movement, we organized Invest India conference in the past edition, wherein, six states including Haryana, Rajasthan, Odisha, Chhattisgarh, Jharkhand and Madhya Pradesh participated and met potential investors from India and overseas,” states Bhupinder.